This article was updated after more information was received from Shropshire Council. Read my response to the consultation. At the same as the council is pushing ahead with reducing the number of officers that work on community support. It has also been debating whether to abolish the area committees (LJCs), which allow local people to hold the council to account. And it plans to reduce business rate relief for many community organisations. These are just three recent moves in the progressive withdrawal of services, and staff jobs, from outside Shrewsbury. This article concentrates on the proposed cuts to customer service points. The council is consulting on closing the smaller customer service points across the county and reducing the hours at the six main hubs including Ludlow by half. The plan is to reduce the opening of the Ludlow customer service point from four days a week to just two. The council claims that usage of the Ludlow customer service point has fallen 57% compared to 25% in Shrewsbury. But this is not a like on like comparison. One third of drop in Ludlow was due to Shropshire Council’s decision to move the customer service point into full public view in the Library when it decided to sell off Stone House. If you have a very personal problem, you do not want to be seen discussing it in the full view of the town. The like on like drop is 27% in Ludlow and 25% in Shrewsbury. The driver for these cuts is the failure of the government to adequately fund local councils, especially those in rural areas. In Shropshire, this has been made worse by problems with budget control and its failure to raise council tax recently. The council leader has recently announced a staff recruitment freeze. It is running struggling to fund services and is approaching the point where essential services are coming under threat. The consultation on customer service points has been launched without providing data on the effectiveness of the three methods of engagement – face to face, internet and phone. There is no information on customer satisfaction for the three methods. We do not have an equalities impact assessment, meaning we cannot assess the impact of the proposed cuts on the most vulnerable. The Ludlow customer service point must remain open for four days a week. There may be a case for reduced hours on those four days, but it has yet to be made. I will be objecting to this proposal. If it is approved by cabinet based on the current information provided, I intend to call it into scrutiny. The above table, provided by Shropshire Council, shows a 53% footfall over the county and 57% in Ludlow. But this headline statistic does not explain the underlying trend very well. It shows there was a huge drop in footfall in Ludlow of 42% between 2014 and 2015. This was when the Ludlow customer service point was moved from Stone House to the Library. The Library set up has never worked. People found they were discussing private matters in a public place. A similar situation occurred in Bridgnorth where the number of customers halved in a single year. To understand the true underlying trend in customer service use, we need to examine the reduction in footfall between 2015 and 2018, so that we are always comparing like on like. 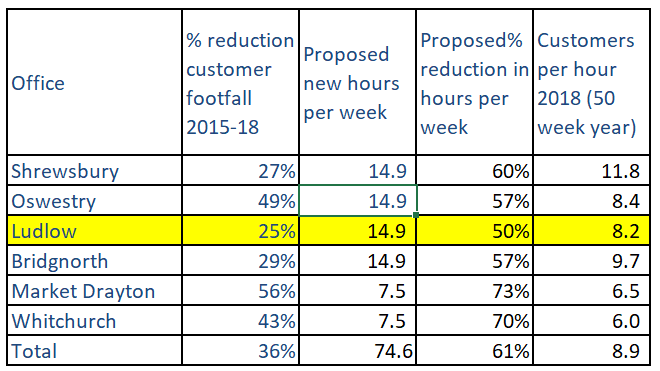 This second table, which I have generated from Shropshire Council data, shows a 36% reduction in footfall overall and a 25% reduction in Ludlow. There is a modal shift in how we access services, especially for younger people. But it would be wrong to become overly reliant on the internet and phone services at this juncture. To do so, would discriminate against older and vulnerable people. Around 16% of adults in Shropshire have not used the internet in the last three months or have not used it all. This is higher than the national figure of 10% and reflects the older age of our county’s population and to a smaller extent the difficulty in accessing the internet in remote rural areas. The trend is for internet use to increase to near 100% of the population but we are around 12 years away from this in Shropshire. And not all queries can be resolved online. For online queries you usually need to have a clear idea of what you need before you start. Use of Shropshire Council’s call centre (Customer Service Centre) has been increasing, according to the consultation (but see update below). The Customer Service Centre does not itself advise on most calls for housing benefits or council tax but passes them on to specialist teams. Customer service points on the other hand do answer these queries, often by contacting the specialist teams. Unfortunately, I don’t have any data for the call centre operations. Much more information is needed before a major decision on cutting back customer service point hours is made. Regrettably, we are unlikely to get that before the consultation closes on 24 August. We are being asked to make judgements in the dark. After I completed this article, I received information on calls to the customer service centre based in Shirehall. These show that the numbers of calls are not increasing but have been broadly level over the last three years. Data for using the internet to access information on customer services is not yet available.
. We now know that the sale money, above £1 million, was invested in the north of the county, not in Ludlow.
. Shropshire Council has issued no information on cuts to staff numbers at the customer service points. Currently staff numbers are: Shrewsbury 3.0 FTE, Oswestry 1.9 FTE, Ludlow 1.62 FTE, Bridgnorth 2.27 FTE, Market Drayton 1.51 FTE, Whitchurch 0.8 FTE. Reserve 0.9 FTE.
. Source: ONS, Internet users, UK: 2018. The survey estimate of 16% non-internet usage in Shropshire is subject to a degree of uncertainty. There is a 95% chance the true figure lies between 12% and 21%.
. Nationally, 56% of people aged 75+ have not used the internet in the last 3 months or have never used it. This compares to 20% for people aged 65-74 and less than 1% for those aged 16-24. The comparable statistic is 23% for people who identify themselves as disabled in the way it is defined in the Equalities Act.
. Nationally, internet use for all adults is increasing by 1.3% a year. That means nationally, near 100% use is seven years away. Applying national figures to Shropshire, we are 12 years away from near 100% use.
. On the day after the consultation was launched, I asked for a range of information. The information on customer service points was supplied. But with less than a week to go before the end on the consultation, I still don’t have a yearly breakdown of calls to Shirehall customer service that cover matters within the remit of customer service points and internet inquiries on matters within the remit of customer service points.